Is work-life balance achievable? Find the answer with the best franchise opportunities! Are you stressed at work? Tired at the end of the day? Missing your children? Would you change all this if you could? Imagine looking forward to work every day and being energized all throughout the day. Imagine having the luxury of seeing your kids as much as you want. There is a way to achieve all of this and more. How? By finding the best franchise opportunity that allows you to have work-life balance doing something you love. Today, the best franchise opportunities offer many lifestyle and financial benefits. 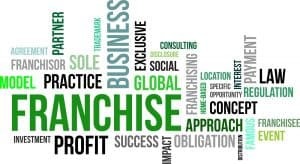 There are so many different types of franchise businesses that there is a right franchise for you. You only need to define what you want your life to be like. Then you can find the company that offers the type of franchise that can deliver these results. Start by defining what you want by asking yourself these questions, and be specific with your answers. How much time flexibility do you want? What type of earnings potential is important to you? What financial resources do you have? Do you have business or people skills? Do you want a family oriented business? Answering these questions will help you determine the type of franchise that would be a good fit for you. Get feedback from family, friends, and trusted advisors as to what skills and strengths you would bring to a business. When you know what you want, there are plenty of resources to help you learn more about franchising and the options available to you. You can do a lot of the basic research online, but you will also want to talk with people in person to get more details. Interview franchisees and company personnel to learn what working with their business is like and how they will support you. Each franchise business is different, so be careful and thorough in researching each one. Be sure to meet with a financial advisor and with legal and tax experts who know franchising so you can avoid scams and understand the financial commitments. The best franchise opportunities can help you achieve the lifestyle you want. You can have a business and a life! If you are ready to find out what is available to you, contact our franchise experts today. Investors, find the best franchise business opportunities with these tips! Are you an investor with successful business experience and funds to invest? Are you ready to find the best franchise business opportunities? We have a few tips that might help you find the right franchise opportunity for you. Start by identifying your expectations for the business. Be specific about what you want to accomplish. What is your income target? What return on investment do you require? Are you going to be involved in the day-to-day operations or have managers? How many locations do you want to have? Investing in a franchise business is a long-term commitment, so another key factor to consider is how long you want to tie up your funds to get the return that you want. If there is an endgame, define what that is. Starting fast can help you reach your goals more quickly. Look for growing industries that have fragmented competition. Find companies that allow you to buy multiple locations over a short period of time. These are indications of outstanding opportunities. Other factors to consider are companies with strong leadership teams, national brands and turn-key business operations systems. Plus, you should be able to leverage your business experience to grow the business even faster. Research each company’s required qualifications for investors. These can vary widely between franchise businesses. Be sure to sure to review the Franchise Disclosure Document (required by the FTC) for each company. This will outline the financial details including potential returns. Another option is to hire a franchise advisor, who can sort out the opportunities and find those that match your goals. If you do this, be sure to hire a lawyer experienced in franchise law to watch out for your interests. The International Franchise Association is a useful resource along with other online franchise associations and organizations. Be sure you work with legitimate sources to avoid scams and misleading companies. Investors can grow wealth with the best franchise business opportunities. Meet your long term financial goals with the best franchise opportunities. Contact us today to find out more about franchising for investors. Find your best franchise opportunity now! Are you struggling to find the best business opportunity or franchise for you? Close your eyes and imagine for a moment that you found the ideal franchise business. Imagine that you have reached your desired level of success. What does your life look like? Living a stress-free life, spending more time with your family and not worrying about paying the bills? Working closer to home or bringing your kids to work with you? Not having a boss and being in control of your own business? This is all within your reach! If you want this kind of success, then you owe it to yourself to look at different franchise opportunities. Find the one that fits your lifestyle and financial goals. The best franchise opportunity in the market today is the one that bridges the gap between where you are and where to want to be. 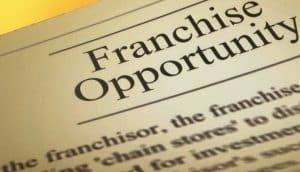 Once you define this gap, you can begin to evaluate which franchise opportunity is the right choice for you. So how do you go about finding the ideal franchise? Start by defining your goals in specific terms, including financial, family and personal goals. List what you enjoy doing: work, hobbies, outside activities, etc. Determine any desired parameters or any restrictions such as location, proximity to home, industry, funding level, etc. Finally, list all the resources that you can bring to the business: financial, professional and personal resources and skills. 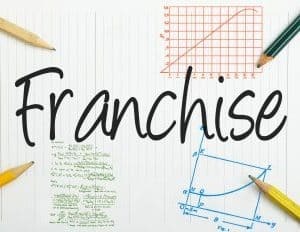 While there are many ways to find franchises, you must be sure that every franchise business you look at is one that you can trust. Check each one with the Better Business Bureau, the Small Business Administration and the Federal Trade Commission. There are also many online resources that can help you avoid businesses that don’t have the best reputation. You can find the best franchise opportunity now to start building the life you want. The evidence is in front of you. You see successful franchises around you all the time. The right franchise can make your vision of the future real! Contact us today to speak with our franchising experts. If you want to make more money in a kid friendly franchise business, consider buying more than one franchise with Pigtails & Crewcuts. Do you want to make money investing in a kid friendly franchise business? Do you want to make enough to leave a legacy for your family? Are you an investor looking for a kid friendly franchise opportunity? 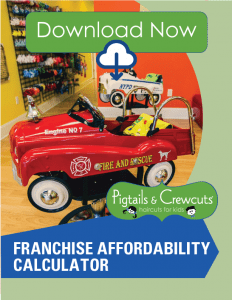 If you are you interested in a franchise business that is family friendly, fast-growing and offers the opportunity for financial success with minimal risk, then you should consider investing in Pigtails & Crewcuts. We offer the best kid friendly franchise opportunity not only for families with young children but also for investors. If you have business experience and investment capital, then Pigtails & Crewcuts might be the right franchise business for you. There are many benefits to owning more than one store including reduced fees, a larger protected territory, and greater revenue. If you have team building experience, you can capitalize on this by building a strong team, including store managers, to help manage the business on a day-to-day basis. Our opportunity for growth is practically unlimited at this point. We opened our first store in 2004 and have room to grow across the country. The children’s haircare sector is approximately $5B annually and most of these salons are single unit locations. We aim to be the number one children’s hair salon franchise in the country, so come and grow with us! We have a strong leadership team with more than 75 years of combined franchise experience. Our initial process will help determine if our franchise is right for you and our business model will ensure your success. You can trust that our team is honest, professional, genuine and supportive and that we will be with you for the long term. We have the best kid friendly franchise opportunity to help you reach your financial goals. You can build a kid friendly business that can grow to meet your family’s long term financial goals. If you are ready to build your legacy, contact us today to find out how you can get started. What is the best kid friendly franchise opportunity to have if you want the kind of lifestyle that fits with people who have young children? Do you have young children? Do you work in a position where you must be away from your children all day? Does your current work situation allow you to live your desired lifestyle with your family? Have you considered making a change so that you can spend more time with your young children? If you answered “yes” to any of these questions, then you should consider investing in a franchise opportunity that allows you to spend more time with your family. Consider Pigtails & Crewcuts, which is the best kid friendly franchise opportunity in the market today for families with young children. You won’t have to sacrifice family time when you work with Pigtails & Crewcuts because you can bring your children to work with you! Our kid friendly franchise opportunity puts children at its center. We offer child haircare services that are needed in your local community. Children need haircuts and parents need a local place that understands the challenges and benefits of working with children, including special needs children. Our target market is children between the ages of 0 – 12 years and there are more than 11 million children between these ages in the US today. You may be wondering about the people behind the business. 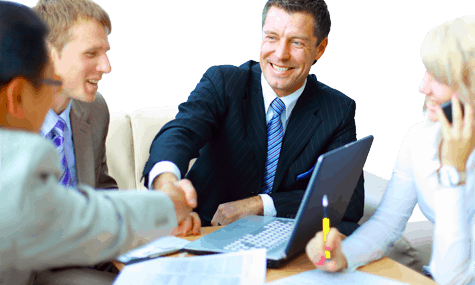 Our leadership team has more than 75 years of combined experience with franchising. They saw the need for the services we offer because they have children of their own. You will have all the support you need to open and operate your store, or even multiple stores, because we have the most supportive, honest and caring franchise operations team. We have several single store owners that ultimately decided to invest in another store or even a third. Our team supports owners who want to grow. If you find that you love our kid friendly franchise opportunity so much that you want to spread the love, then we will help you do it! We have the best kid friendly franchise opportunity today if you want to build a business that fits your family’s lifestyle. You can build a kid friendly business that can grow along with your family. If you are ready to change your lifestyle, contact us today to find out how we can help you reach your goals. You can have fun and build financial independence with the best kid friendly franchise opportunity, Pigtails & Crewcuts. You have decided to buy a franchise, especially a kid friendly franchise. Which kid friendly franchise opportunity is the right one for you? You must start with defining your goals. Some goals might include working with children, having fun, bringing your kids to work, achieving financial independence, working with your spouse, or providing a needed service to your local community. If any, or all, of the goals listed above appeal to you, then Pigtails & Crewcuts might be the right franchise opportunity in which to invest your time, skills, passion and money. We have such a fun, happy environment in which to work, be involved with your community and help children and parents. You can satisfy both parents’ and children’s needs while providing a good living for your family. Our business is not a trendy one that will disappear in a few years. It will weather better than most any economic downturn because parents will still have their children’s hair cut. You need to be fully informed about any franchise opportunity that you investigate since this is a lifelong and life-changing decision. We will take you through a process that will show you how you can get to where you want to be from where you are today. We will help you determine if this is the right kid friendly franchise opportunity for you. In our franchise business, you are supported all along the way to grow to the level that you desire and to avoid pitfalls as you grow. You can achieve the life you want through a Pigtails & Crewcuts kid friendly franchise opportunity. The best way to see for yourself is to visit one of our salons and see how fun and happy the environment can be. You can reach your financial and family goals while having fun with our kid friendly franchise opportunity. If you have young children, now is the time to get started on building the future for your family. Don’t wait. Contact us today to find out how you can get started in our successful franchise.